In addition to the the common specialty instruments used in orthopedic procedures that you see below, Millennium Surgical can reference any catalog number from any company to provide you with high-quality instruments such as forceps, retractors, clamps, and more. Use the search function to find exactly what you need, browse through instruments by specialty, or talk to one of our Instrument Experts, online or by phone, and get help finding the instruments that will best fit your needs. 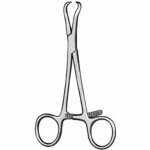 You can give us any part number from any surgical instrument company, and we will find the same or an equivalent instrument for you. Already have an instrument that you need to replace? We’ll use the part number etched on that instrument to find the perfect replacement or addition to your set. Millennium guarantees the orthopedic surgical instruments we sell, so you can buy with confidence knowing that your purchase is protected by our ServicePLUS Guarantee. Don't see what you're looking for? Use the search function, or contact an Instrument Expert for more information! Arthroscopy Instruments	Graspers, punches, scoops, chondrol picks, hooks, scissors, elevators, biopsy rongeurs, and more. 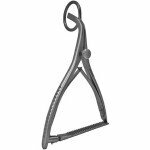 Bipolar Bayonet Forceps Non-Stick	Compare to Stryker*, Silverglide*, Codman's* Mallis, and Integra's* Buz Lite. 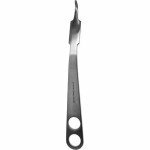 Bone Clamps and Forceps	Includes Vogen, Stagbeetle, Reduction, Perforating, Phalangeal, Malleolar, Dingman, Lewin, Holding Forceps, Verbrugge, Kern, Lane, Lambotte, and more. Bone Mill	Bone mill including cutting drums, table clamp, body with handle, push block and lock nut. 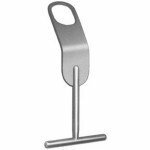 Countersinks Taps and Handles	Coupling handles, countersinks, and taps in a variety of sizes and lengths. Ikuta Bone Clamp	Jaws with 8 pointed teeth for stabilization and guidance. Space between prongs for k-wire or screw placement. Available in straight or angled patterns. Joint Calcaneal and Bone Distractors	Two hole sizes and two arm designs allow fro easier pin size selection and helps with distraction in a variety of indications. Kobel Self Rotating Retractor	Kobel retractors and retractor blades. 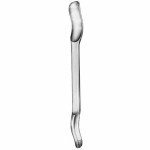 Large Bone Curettes	Contoured handles to keep the curette from slipping and for better control. 10.5" shaft length. Available in various sizes, straight and angled. Lead Hands	Lead and aluminum hands used as a platform for performing hand surgery procedures. Mallets	Mallets featuring phenolic and aluminum handles, nylon caps, and lead-filled heads in styles such as Hajek, Partach, Cottle, Gerzog, Colin, Mead, Cloward, Crane, Bergman, Kirk, Ombredanne, Heath, and more. Orthopedic Drill Bits	Surgical grade drill bits with Jacob chuck end and quick connect end. 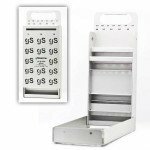 Sterilization and storage tray for drill bits. Orthopedic Screwdrivers	Star screw driver bits, quick coupling handles, power drill adaptor, standard screwdriver bits and screwdrivers, hexagonal screw driver bits and screwdrivers. Rod Cutter	Base or table mounted rod cutter with four different sized holes. Customizable handles, colors, and finishes. 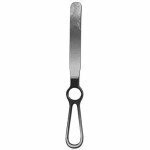 Rod Grippers and Benders	Rod benders in various lengths and styles, rod grippers, broad nose clamp, rod holders, power grips, and rod forceps. 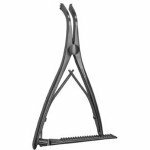 Spreaders	Abramsohn retractors, calibrated femoral tibial spreaders, lamina spreaders, tibial spreaders, and more. Surgical Screw Extraction Set	This set of surgical screw extraction instruments features hooks, gouges, forceps, extractors, bolts, reamers, and a quick coupling handle with a storage tray and an instruction template. Parts also available separately. Traction Tower and Hand Table	Hand tables and retractor components, traction device, equalizing devices, traction tower, finger traps, and more. Wire and Pin Instruments	A variety of wire twisters, tighteners, cutters, chucks, and bows.